The immoral passage above cuts straight to the point. Very often, we atheist find ourselves tangled in debate with theists on the subject of morality; particularly, the moral compass of God. It’s often posited that the Bible is a “good book,” inspired by a moral, timeless entity. In my experience, Christians seem to only be aware of the first few chapters of Genesis, a bit of Exodus, Psalms, the four Gospels, and a few Pauline letters; you know, where all the fuzzy, lovely stuff exists. Unfortunately for them, that isn’t the entirety of the Bible. The religious believe as though they live with the highest of moral esteem, placing the Bible on a pedestal, believed (by them) to be untouchable. But the “good book” they support and cling to is anything but good, and Steve Wells does a wonderful job expressing that fact. 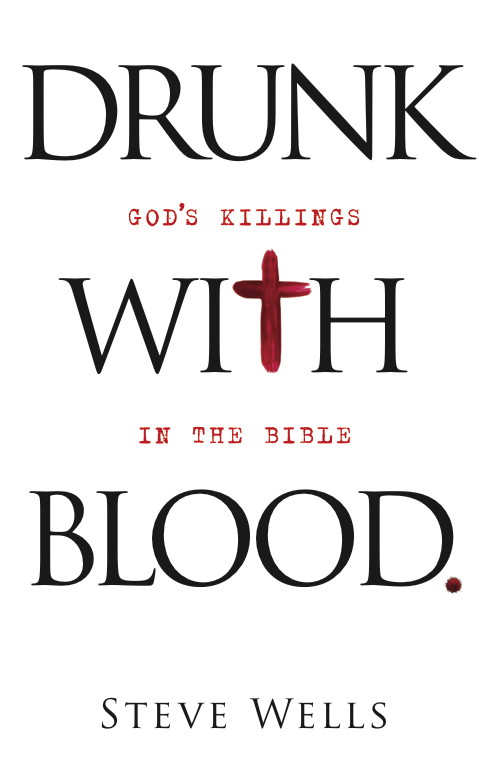 In Drunk with Blood: God’s Killings in the Bible, Mr. Wells (the developer of the Skeptics Annotated Bible website and author of its companion book The Skeptics Annotated Bible) delivers a resourceful and startling guide, taking its readers through the bloodshed found in the Bible; and not just the Bible, but also the Apocrypha (found in the Second Edition). His commentary is witty and thought-provoking; surely so inspiring even the most sincere Christian will think twice before claiming the God of the Bible is good. The scripture I provided above is found on the back cover of his book, wonderfully illuminating the Bible’s vile and atrocious content. I’ve spent many hours investigating the Bible in research for my book and I will admit I found many passages in Wells’ book that escaped my skeptical eye. It’s definitely a testament to the time and effort put forth by Mr. Wells during his years working the Bible over. So, all-in-all, what does this book offer? I’m truly honored to consider Mr. Wells an associate. I’m grateful for the opportunity to read this amazing piece of literature and I hope he continues doing what he does best: eviscerating highly-revered religious texts. This book, including his website, will continue to influence not only me, but a countless number of reason-warriors, to question the Bible for years and decades to come. So, if you find yourself in discussion pertaining to the Bible and God’s so-called “goodness,” you’ll know where to turn to. You can find his website, The Skeptics Annotated Bible, can be found here. Someone named Brucker talking about the SAB? I thought you were me for a second! Steve Wells is definitely a great writer, even if you disagree with him. He really forces you to think. Well what do you know!? Haha I rarely encounter another Brucker, let alone an atheist (I’m guessing?). I very much enjoy his books, his website has been a tremendous help. No, not an atheist. I came across this post when I was doing a Google search for my own blog (I don’t know how to add a link here but you should get it if you click on my user name) and you came up as the second link. You’ve got some good writing yourself; maybe I’ll stick around and read some more today.